The Sudoku Sheets add-on is available here. Click on the "FREE" button to install, which makes it available to Google Sheets whenever you're logged in to Google. After you grant the necessary permissions, you're ready to create and solve Sudokus. 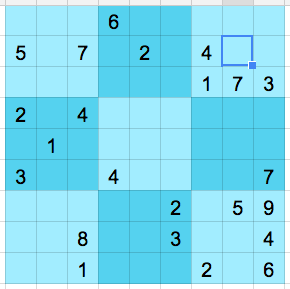 If you want to solve a Sudoku generated elsewhere, select "Create your own Sudoku". 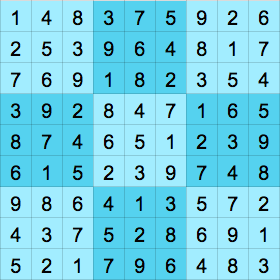 To solve the Sudoku, just select a cell and enter a number. You can turn off Assisted Mode via the menu, in which case you can work toward a complete grid and then select "Check Solution". Note: Since the Sudoku generator starts with a solution and removes numbers to make the puzzle, the Add-On could remember the solution and simply display it when the user presses "Solve". That's cheating. We don't cheat. 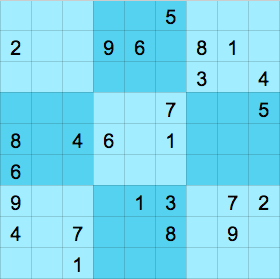 The Sudoku Sheets add-on uses Google's Linear Optimization Service to find solutions. 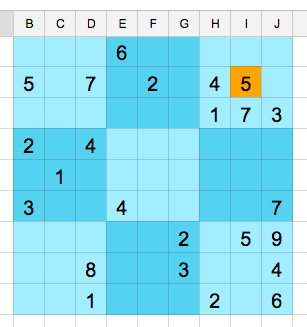 Each cell in the grid is treated as a variable with nine boolean constraints: "is it 1? ", "is it 2? ", and so on. So in total there are 81 variables and 729 constraints. // an objective function using random weights. // Constraints: each value appears once one each row, column and sub-block. // Solve the Sudoku grid. // If the remote Linear Optim Service fails, try to solve locally.